I don’t usually do incoming books posts because most weeks it would be a bit dull. I have been trying for a long while now to buy fewer books than I read, in the vain hope that my TBR will start to look a bit more manageable. However, these past few weeks I seem to have new (to me) books coming out of my ears. Which is nice. First I went to the lovely Foyles and bought two collections of essays by various authors – The Library Book and Stop What You’re Doing and Read This! – both of which I think I had heard about on Savidge Reads. 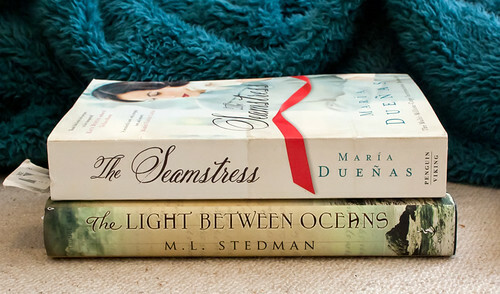 Next up I was sent a couple of books for review by publishers – The Light Between Oceans by M L Stedman (which I reviewed here) and The Seamstress by María Dueñas (which I have just finished reading and am mulling over before I post my review…watch this space!). 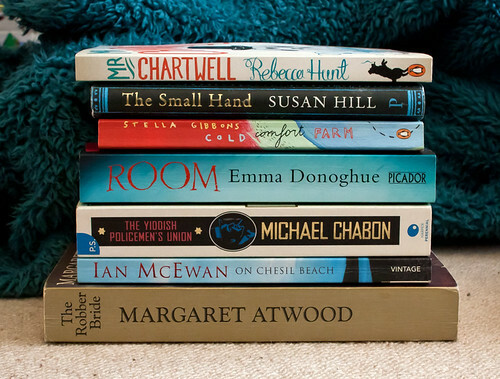 And finally, because the TBR wasn’t groaning enough already, I borrowed some books from the friends we stayed with! But I had good reason. When Tim and I recently watched I, Robot he decided that I was sorely lacking in background knowledge of Asimov so he asked Twitter for recommendations of where to start educating me. 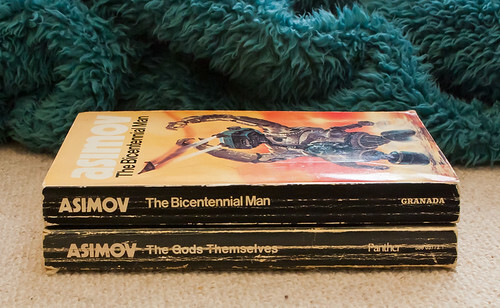 Handily, the response was books that Tim doesn’t actually own but I now have on loan The Bicentennial Man and The Gods Themselves. Now what order to tackle this little lot in? Oh you got so many great books!! I love Asimov, and I hope you enjoy these. I personally love the foundation series but the ones you picked are also very good. Re Asimov the I, Robot short stories collection is also interesting. Lots of people recommended the Foundation series to me too but it was a painful drudge to get through, I wouldn’t bother with those. Bella I know, I can’t wait to dig into these! dan Yes, the I, Robot stories were where the discussion started but consensus seemed to be that The Gods Themselves is a better starting point. 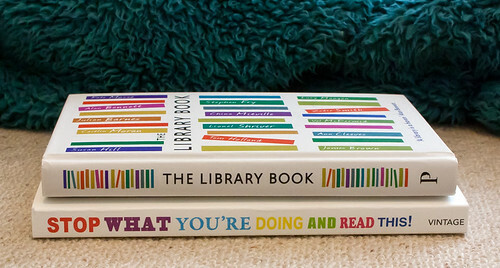 Those first two (The Library Book and Stop What You’re Doing and Read This) look very pretty. Your pile reminds me of the days in my youth when I would go to the annual library book sale and come home with a groaning sack of books! I miss those days. BTW, thanks for visiting my blog!